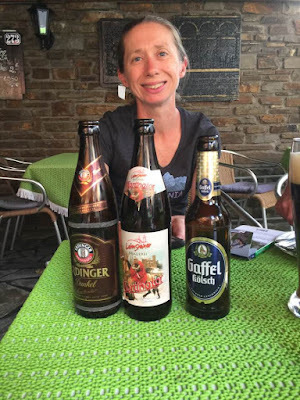 After spending a week in Chamonix, France hiking, running and enjoying all the UTMB festivities, Dad, Stephanee, John and I headed to Germany to hike the upper middle section of the Rheinsteig. I was a little nervous about the hike because only a day earlier I had run the CCC, but we DNF'd 55km in, so my legs weren't totally destroyed. We drove from Chamonix to the Frankfurt airport to drop of the car and our extra luggage, since we were flying out of Frankfurt. After 6 hours in the car I was very happy to get out and walk around, my poor feet were so swollen. We took a 2-hour train ride from the airport to Kamp-Bornhofen, where we were going to start the hike the next day. The train ride was beautiful; the majority of it was along the Rhein river and we passed through all the towns we were going to hike through the next 4 days. 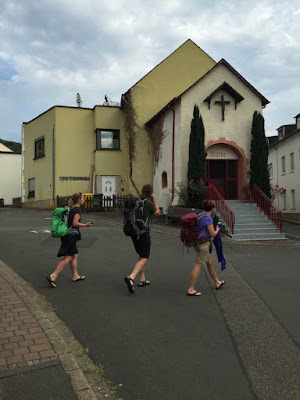 When we got off the train in Kamp-Bornhofen, we had a 2 km walk to our hotel. My dad wasn't too excited about it, but once we got going, it was a pleasant hike through the town. Upon checking into the Gartenhotel we were informed we only had a few minutes before they stopped serving dinner. We dropped our stuff off in our rooms and headed out to the beer garden. We were so excited to get German beers. Well, Stephanee was excited to get a good Riesling. They did not disappoint. We chatted about the hike, had dinner and headed to bed. We had great breakfast at the hotel in Kamp-Bornhofen, and started our climb out of town, which was ~900 feet uphill. Which normally is pretty easy for me, but it felt awful. My legs felt heavy and my backpack felt even heavier. I hadn't carried a full pack since we hiked the Dolomites last year but almost immediately I knew I had arranged my pack incorrectly. Once we reached the top of the hill I rearranged my pack and was grateful that we only ran 55 km of CCC. I'm not sure what I was thinking about planning a 4-day hike less than 2 days after CCC. At the top of the hill we were greeted with our first castle, the Sterrenberg Castle with an impressive white tower. We were able to walk through the gates but it appeared that part of the castle had been turned into a restaurant. Only 150m from Sterrenberg was the Liebenstein Castle, I didn't realize they were 2 different castles until I read about them later. Enemy castles of days past. The trail weaved through the forest and meadows, with amazing views of the Rhein river, which reminded me a lot of the Columbia Gorge. As we got closer to Sankt Goarshausen, we started to get views of the Maus (mouse) Castle and started to get excited to visit it. Sadly, when we arrive there was a note saying it closed in June. The castle had an amazing door on it with a falcon. Someone said they raised falcons in the castle, but I never verified it. We made our way to Sankt Goarshausen, checked into our hotel Nassauer Hof. We were informed that the beer garden at the hotel didn't open for a few more hours. So after showering, John and I went to find beer while we waited for Dad and Stephanee to finish their hike. While we drank beer by the river I read that there was a great veggie friendly restaurant on the other side of the river in Sankt Goar. So we decided to take the ferry across the river to have dinner. The restaurant was closed, so we found another place by the river and had an ok dinner. But really any dinner by the Rhein after a good day of hiking is a good dinner in my opinion. After breakfast at the hotel we went to checkout and the hotel owner told us that part of the Rheinsteig we were going to hike that morning was washed out and impassable. She gave us several alternative options, and we chose to walk along the Rhein to the statue of Lorelei that sits on an island in the river. From there, there was a path / stairs that went uphill for quite a while to connect us to the Rheinsteig. Not long after getting on the Rheinsteig we reached the famous Lorelei rock. Where according to folklore, the beautiful Lorelei would sit on the cliff combing her blonde hair, distracting shipmen with her beauty and song. The trail traversed through a lot of vineyards, which provided amazing views of looking down the grapevines to the Rhein river. About half way through the hike we reached a big field with a circle of large chairs, the back of the chairs had some sort of religious symbol on them. I am not sure what they were for, but interesting to see nonetheless. Right before started the descent into Kaub we came upon a cabinet that said, "Sesam öffne dich!" (Open Sesame). So of course we opened it and we were rewarded with little bottles of Riesling wine. Every hike should have a wine or beer box on trail! John and I reached Kaub before Dad and Stephanee, so we decided to take the ferry over to the Pfalzgrafenstein Castle, which was a toll castle commissioned by King Ludwig the Bavarian in 1326. We spent the night at the very nice Rhein Turm Hotel and had an amazing dinner. I was excited that they had a full vegetarian menu. I highly recommend the hotel and restaurant if you are in Kaub. Our 3rd day of hiking was our shortest, which we were all looking forward to, especially since it was supposed to be a hot day. We started with a climb out of Kaub through vineyards with the Gutenfels Castle towering above us. Which at one time was a hotel but closed years ago and isn't open to the public, so we just got to admire it from afar. As we continued along the Rheinsteig we saw trail marker signs with wine glasses on them and signs that said "Weinstand". I got excited that we were going to get another wine box en route. After a few hours we reached the Weinstand, which looked more like beer garden in the middle of the trail, but sadly it was closed. I don't understand why they weren't serving beer at 10:30am, it is Europe after all! The trail continued along vineyards with excellent views of the Rhein and several castles on the other side. A few of the castles looked to be hotels or restaurants. As we approached Lorch we encountered another castle, or castle ruins. The Nollig Castle ruins were gated off, so once again we had to view it from a distance. Lorch is known for its wineries, since we had a short day of hiking we were looking forward to sampling some local wine. Unfortunately, a lot of wineries were closed in August or on Wednesday, but the tourist office did provide us with a wine tasting. One winery was open and had a restaurant, Laquai, so we decided to have dinner there. I thought the dinner the night before was the best I had had on the trip, but Laquai topped it and the wine was spectacular as well. We spent the night at Hotel Im Schulhaus. Our last day of hiking was originally 22 km, but when I looked at the map and realized the Sankt Hildegard Abbey was only a few kilometers further with at direct path down to Rüdesheim, I decided we should pay the Nuns a visit. Who wouldn't want to walk a few extra kilometers to taste wine made by German Nuns? Knowing it was going to be a warm and long day we got started early. The morning was wonderful; the trail climbed up and down through vineyards again. Before descending down into Assmannshausen we came upon another wine box, when I opened it had a scanner that checked IDs to unlock the actual box with the wine. Unfortunately, it wouldn't accept our US driver's license or passports, so I grumbled about it under my breath all the way down to Assmannshausen. It was nearing midday when we got to Assmannshausen and it was starting to get hot. I also noticed a cable car in Assmannshausen, so I pulled out the map and realized that you could actually take the cable car up to the Niederwald hunting lodge, rather than hiking all the way up. I was tempted for a moment, but too stubborn to actually do it. About midway up the grueling, view-less ascent, I sent my Dad a text message telling them to take the chairlift up and save their energy for the hike to the Abbey. He texted back saying they were going to stop for lunch in Assmannshausen and would probably take the lift up. That meant they were over an hour behind us, I was hoping the long day and heat weren't getting to them. Once John and I made it to the top we realized we were in the middle of a tourist area. There is a lift that goes to Rüdesheim not far from the Assmannshausen lift, which makes it the perfect afternoon trip for all the tourist who stop in the various cities via boats. I found myself slightly annoyed to be around so many people after 4 days of see less than 10 hikers each day. My first reaction was to get out of the tourist area ASAP, but then I saw a sign for a castle and thought this might be my last chance to actually get to visit a castle on this trip. The castle was just a few ruins, we passed through quickly. I was now ready to get rid of the crowds, and head to nuns and wine. Not long after we passed the Niederwald Monument we started to see signs for the Abbey. All of a sudden my mood changed. Then off in the distance we saw the twin towers of the Abbey's church and I got really excited. Only 1.1 km to go! The Abbey was gorgeous, I had my glass of wine, bought a bottle to take home and one for Dad and Stephanee, just in case they didn't make it to the Abbey (which they did). After 4 days of hiking and close to 50 miles, we made it to Rüdesheim! We celebrated over a wonderful meal in the beer garden of our hotel. The Wandering Wallaces had completed another successful hike! We spent the last 2 days of our trip drinking beer in Köln and Düsseldorf.